Kate Middleton is getting ready to be Queen consort one day, so it makes sense that she is getting lessons from the monarch herself. It seems the Duchess of Cambridge has been quietly meeting with Queen Elizabeth II to help prepare for the future. Kate has been making visits to Buckingham Palace without public knowledge, according to the April 22 print issue of Us Weekly. Apparently, she has become a frequent visitor, especially since she and husband Prince William moved into the nearby Kensington Palace full time in late 2017. 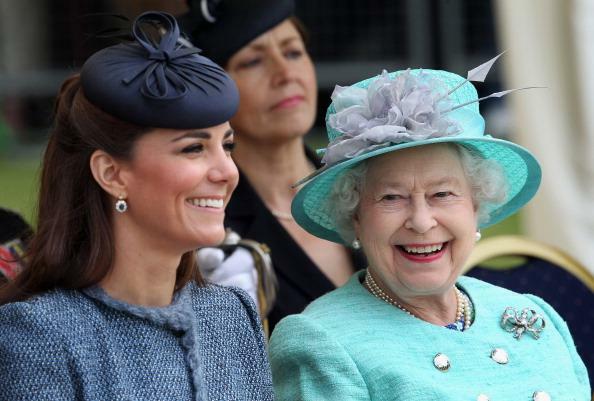 The Queen, who is said to be very fond of Kate, has apparently shared some very personal details. “She’s told her a lot about her own experiences. She’s really taken Kate under her wing. The two of them will often spend hours discussing royal life and the future of the monarchy,” the source said. Kate has been taking more senior responsibilities in the royal family, including making a public appearance alongside the Queen last month. They visited King’s College London together. In addition to her duties expanding, Kate has been working to improve her confidence and stage presence. Unlike sister-in-law Meghan Markle, Kate’s first time in the spotlight was when she joined the royal family. “Kate has been quietly honing her public speaking skills behind the scenes,” a royal source claimed. There is no rush, though. It’ll be a while before Kate becomes Queen consort. When Queen Elizabeth steps down, it’ll be Prince Charles who takes over as King of England. Prince William won’t ascend the throne until his dad steps down.